We always have new and exciting things happening in the lab! Read below to learn more about our ongoing research activities, students’ achievements, and more. 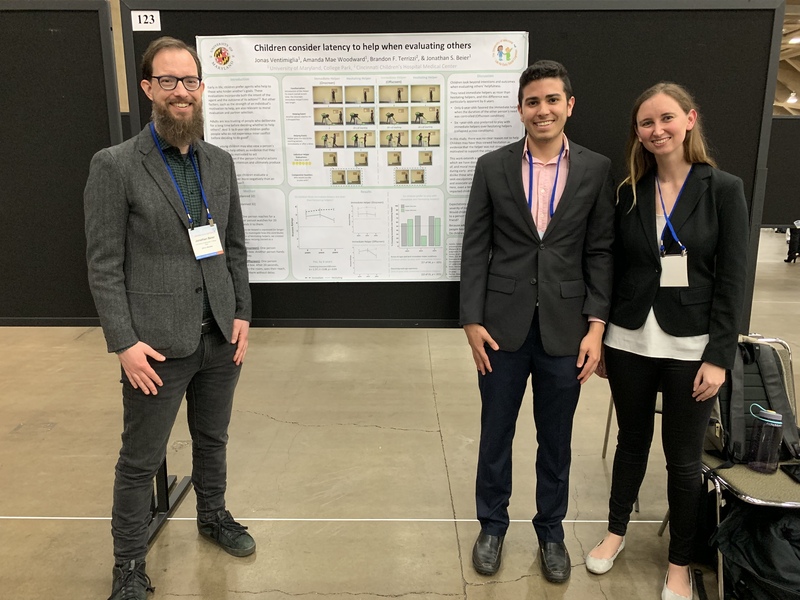 Dr. Beier, graduate student, Amanda Mae Woodward, lab manager, Suzanne Woller, and undergraduate honors student, Jonas Ventimiglia, attended the conference for the Society for Research in Child Development (SRCD) in Baltimore, MD. Suzanne and Amanda presented a poster on 6-year-old's understanding of social reputations. Amanda also presented a poster examining children's expectations of comforting behavior between friends. Jonas presented a poster on children's evaluations of those who help. The lab presented two other posters with lab alumni Shirley Duong and Brandon Terrizzi. Shirley is now a graduate student in the cognitive psychology Ph.D. program at the University of Pittsburgh, and Brandon is a post-doc at Cincinnati Children's Hospital. We had a great time catching up and talking about our respective research! Click here to view all of our posters from the conference. Amanda Mae Woodward presented her research exploring children's expectations of comforting behavior between friends at the Budapest CEU Conference on Cognitive Development. Congratulations to our winter graduates, Tara McCurry and Lauren Kinzie! 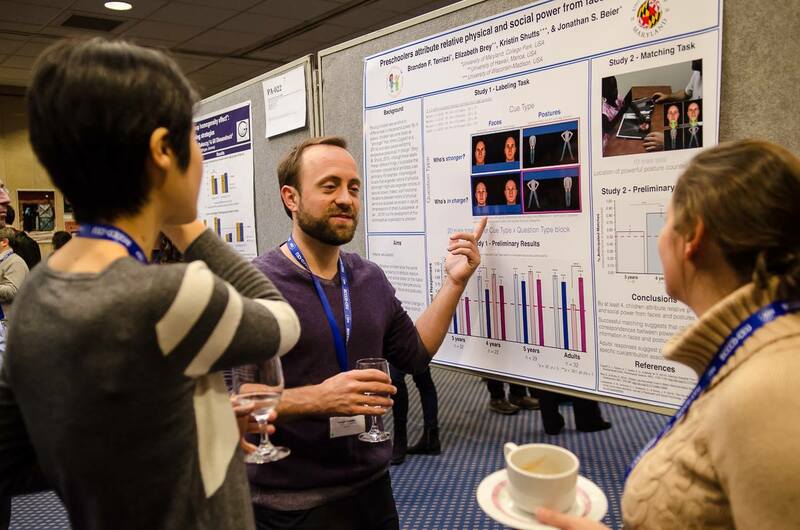 The lab had six posters accepted for the SRCD conference this March - we're excited to share our work in Baltimore! During our last lab meeting of the semester, our members made holiday cards for injured veterans at Walter Reed National Military Medical Center. 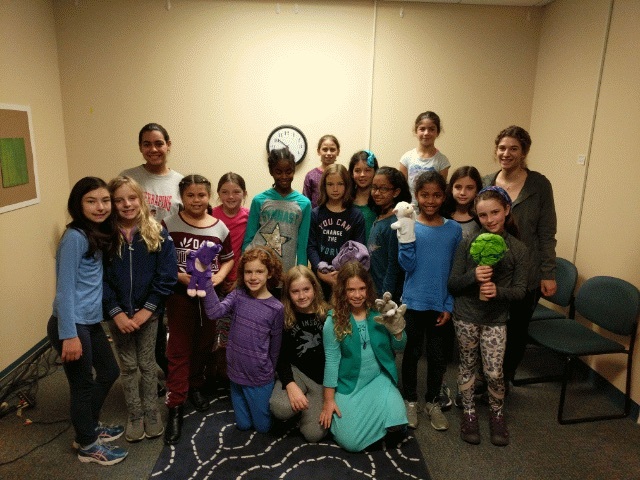 The lab welcomed a troop of Girl Scouts to learn about psychology research - they did a mock participation in one of our behavioral studies and asked so many great questions! Many of them hope to study psychology one day. Amanda Mae Woodward will present a poster on children's expectations for selective comforting between friends, at the Budapest CEU Conference on Cognitive Development this January. Brandon Terrizzi's recent doctoral dissertation was accepted as a journal article in Developmental Psychology, entitled, "Children's Developing Judgements about the Physical Manifestations of Power." Brandon's work argues that a developmental perspective is necessary for understanding adults' first impressions of others. Congrats, Dr. Terrizzi! The first paper to emerge from a cross-lab grant from Canada's SSHRC was accepted in Developmental Psychology! Tara Karasewich, a student at Queen's, is the lead author on "Getting Help for Others: An Examination of Indirect Helping in Young Children." Welcome back to all of our fall undergraduates! 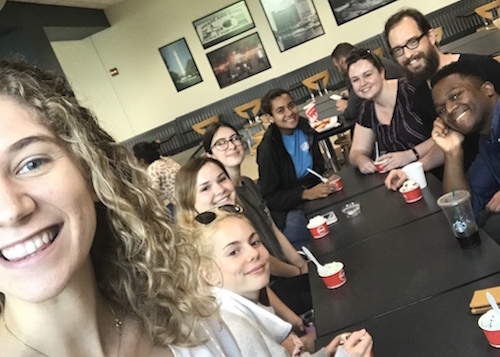 The lab took a field trip to the UMD Dairy! Past research assistant, Cole Dougherty, won free ice cream coupons during Teacher Appreciation Week for tweeting out a picture of him and Dr. Beier. Thanks for the free ice cream, Cole! Dr. Beier and graduate student, Amanda Mae Woodward, presented at ICIS in Philadelphia, PA. Past lab manager, Shirley Duong, joined them to present at SPP in Ann Arbor, MI. Congratulations to all of our spring graduates and welcome to our new lab manager, Suzanne Woller! Two of our recent graduates, Elana Israel and Cole Dougherty, accepted new positions in the field. Cole will be working as a lab manager in the Austin Thought Lab at the University of Texas, Austin, and Elana will be working as a research assistant in the Treatment and Etiology of Depression in Youth Laboratory at McLean Hospital in Boston. Congrats! 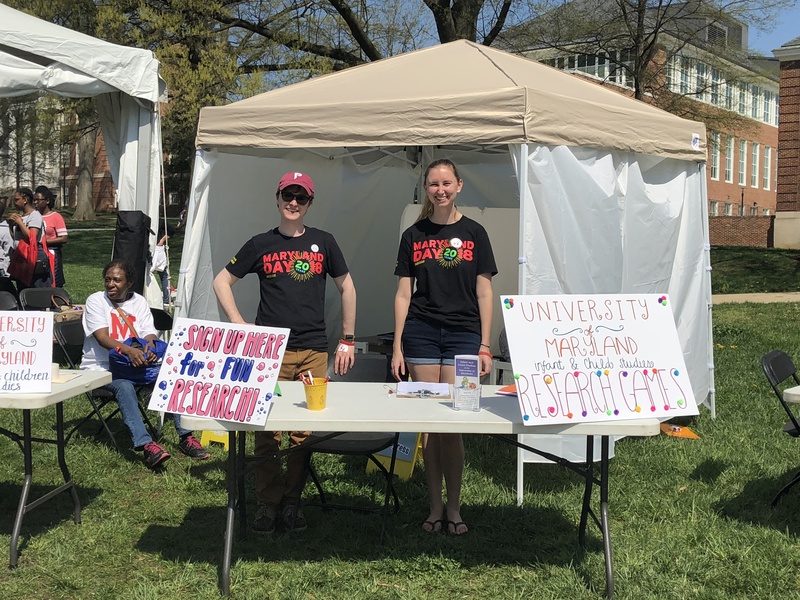 The lab participated in Maryland Day 2018 on Mckeldin Mall. Our researchers invited families to participate in a research game, and children were offered a prize for their participation. It was a beautiful and fun day! Graduate student, Brandon Terrizzi, successfully defended his dissertation, "Children's developing judgments about the physical manifestations of power," on April 10th! Congratulations to Dr. Brandon Terrizzi! Dr. Beier and Dr. Kristen Dunfield published a theoretical commentary on how children may respond when other people experience complex negative states, at Frontiers in Psychology. Current research assistant (RA), Irene Gomez, will be attending the Chicago School of Professional Psychology in Washington, D.C. starting Fall 2018! Former RAs, Jose Lima-Rosas and Cori Gold, have accepeted offers to graduate school programs! Jose will be joining the Ph.D. Counseling Psychology program at the University of Maryland and Cori will be attending the Chicago School of Professional Psychology in Washington, D.C.
Graduate student, Brandon Terrizzi, has accepted a post-doctoral position at the Cincinnati Children's Hospital in the Department of General and Community Pediatrics! Lab manager, Shirley Duong, has decided to attend the University of Pittsburgh in Fall 2018 to join their Psychology Ph.D. program! Congratulations to Irene, Jose, Cori, Brandon, and Shirley! Dr. Beier organized a symposium at the Budapest Conference on Cognitive Development, focusing on children’s recognition of prosocial obligations. 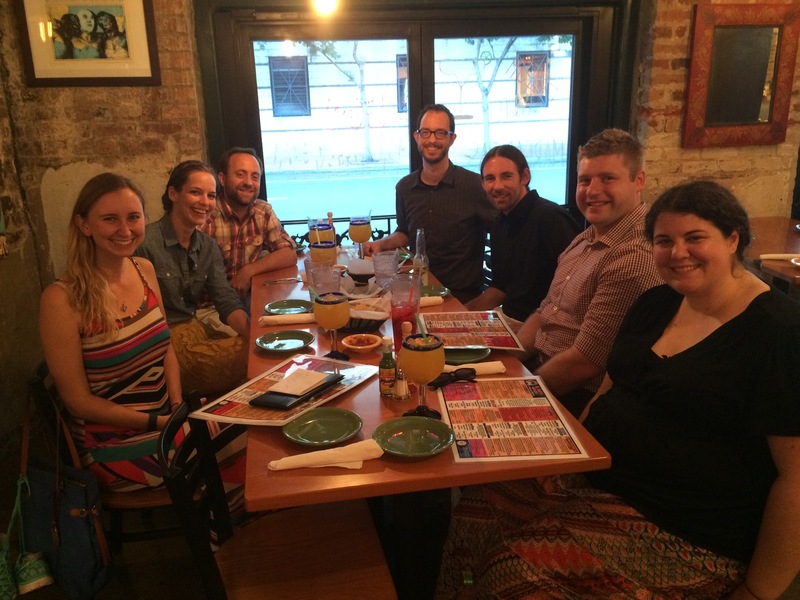 Graduate student, Amanda Woodward, successfully defended her Masters today! Congrats, Amanda! Graduate students, Amanda Woodward and Brandon Terrizzi, presented at CDS in Portland, OR! Three presentations were made, two posters and one symposium talk. Dr. Beier, along with Dr. Lucas Butler and Dr. Geetha Ramani of the Human Development program, gave talks at the Port Discovery Museum, where research is conducted and made possible through a wonderful partnership with the PDM staff!. Graduate students, Amanda Woodward and Brandon Terrizzi, and undergraduate student, Jonas Ventimiglia, will be representing the LESC at CDS in October! Three presentations--two posters and one symposium talk--have been accepted at CDS. 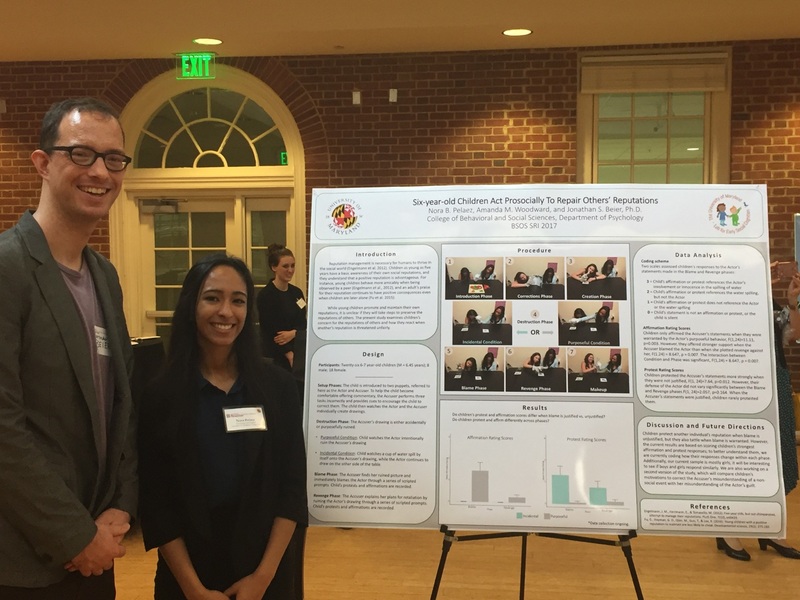 Undergraduate Nora Pelaez presented her poster as part of UMD's Summer Research Initiative (SRI)! Nora worked on a project examining young children's concern for the reputations of others and how they respond when another's reputation is threatened unfairly. To learn more about the SRI Program, click here. Congratulations to all of our graduating seniors and welcome our new lab manager, Shirley Duong! Best of luck to our former lab manager, Noor Qasmieh, who will be starting her journey towards a Ph.D. in Clinical Psychology at UMD in the fall! Graduate Student Brandon Terrizzi presented at the Society for Philosophy and Psychology Conference. Congratulations to our graduating seniors: Rachel, Nicole, Elisabeth. Thank you for all your hard work! Undergraduates Nora Pelaez and Jonas Ventimiglia received funding for summer research in the lab. Nora will participate in UMD’s Summer Research Initiative, and Jonas will be a UMD Summer Scholar. Congratulations, Nora and Jonas! Graduate student Amanda Woodward presented a research poster at the Society for Research in Child Development conference in Austin, Texas. Both Dr. Beier and graduate student Brandon Terrizzi gave talks at the Society for Research in Child Development conference in Austin, Texas. The Lab for Early Social Cognition represented the Infant and Child Studies Consortium at a local elementary school science fair. So many families learned about the research we conduct! Graduate student Brandon Terrizzi won the SRCD Student Travel Award to attend the SRCD conference. 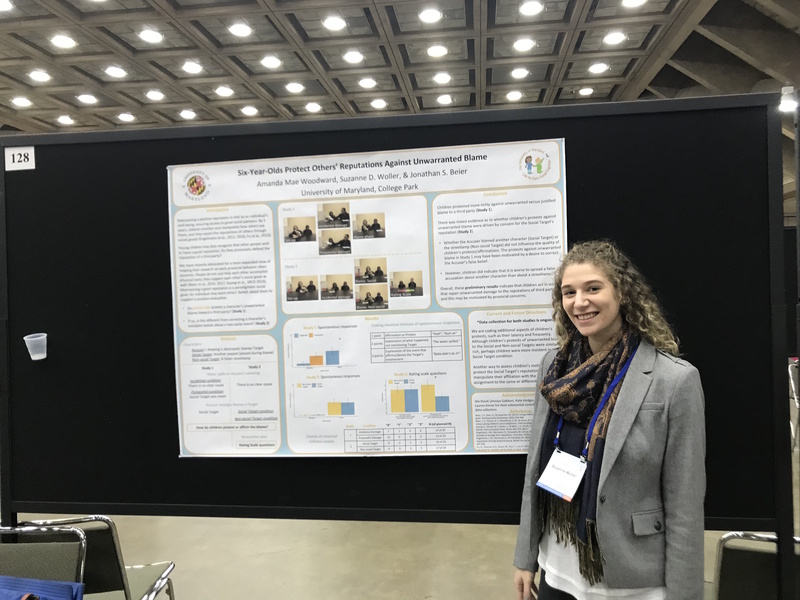 Graduate student Amanda Woodward won the UMD Goldhaber travel grant to attend the SRCD conference. Lab manager Noor Qasmieh has decided to attend UMD’s Clinical Psychology doctoral program, to begin this fall. Congratulations, Noor! 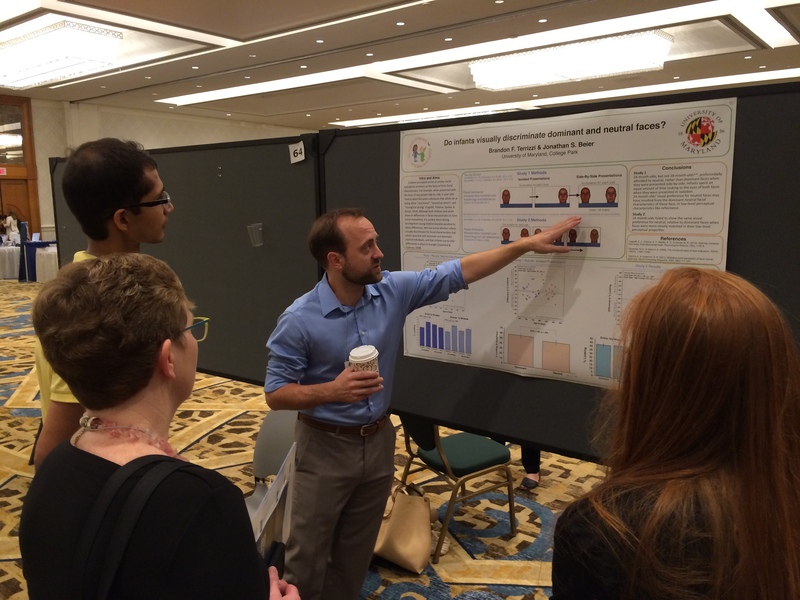 Graduate student Brandon Terrizzi presented a research poster at the Budapest CEU Conference on Cognitive Development. Graduate student Amanda Woodward proposed her master’s thesis, and is ramping up to begin data collection. Welcome back, everyone! Good luck for the fall semester! Dr. Beier's paper about social helpfulness in young children was accepted for publication in Child Development, with co-authors Amanda Woodward, Brandon Terrizzi, and Emma Larson. Brandon Terrizzi's paper about cueing covert spatial attention was accepted for publication in Cognitive Development, with co-author Dr. Beier. Way to go Brandon! Our Summer Research Initiative students presented posters of their summer research! Great job Jose and Alec! Our new lab manager, Noor Qasmieh, has begun at the LESC. Welcome! Three of our undergraduate research assistants received funding for summer research within the lab. Congratulations to Danayt, Jose, and Alec! Dr. Beier and Brandon Terrizzi attended the Society for Philosophy and Psychology Conference in Austin, TX. 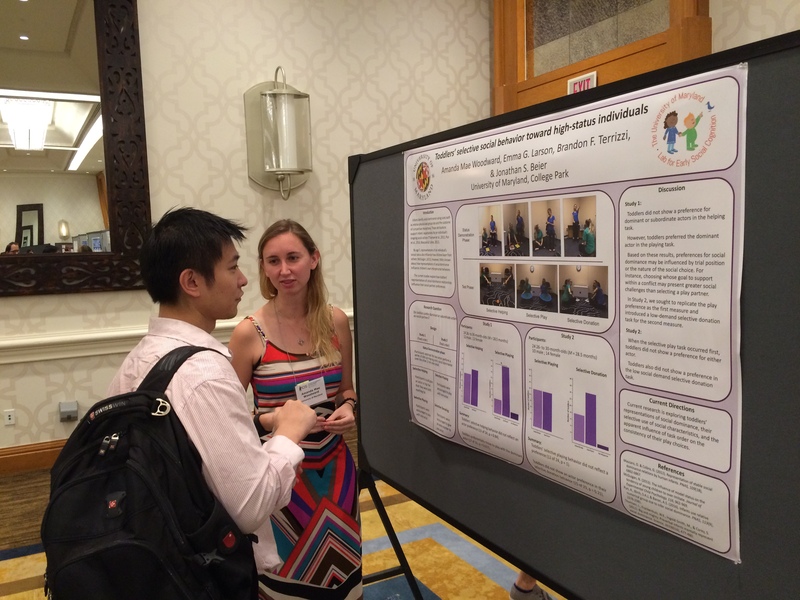 Dr. Beier, Brandon Terrizzi, and Amanda Woodward presented posters at the International Congress on Infant Studies Conference in New Orleans. research, and service to the department. Way to go, Brandon! Dr. Beier gave an invited talk at George Mason University. Lab Manager, Emma Larson, has decided to attend LSU's School Psychology doctoral program for her graduate studies. Congratulations to our graduating seniors: Hallie and Chris. Thank you for all of your hard work! The interaction between friendship and language skills. The manifestation of social helping behaviors in children with psychological disorders. The influence of minority and majority groups on dominance behaviors in children. The relationship between social exclusion and mental health. The impact of the internet on children's social relationships. Evidence of Autism Spectrum Disorders predicted by eye tracking technology. The impact of shyness on sociability in children. The link between face trait attributions and helping behavior in children. The development of facial judgments and decision making ability in children. expectations for prosocial behavior among friends. Cognitive Development Society in Columbus, Ohio. View the posters here and here. the influence of dominance attributions on gaze cueing. Dr. Beier gave invited talks at Queen's University in Kingston, Ontario and Concordia University in Montreal, Quebec. Many thanks to everybody at both institutions for stimulating discussions and two great visits. and Psychology, held at Duke University in Durham, North Carolina. View the poster here. Congratulations to our graduating seniors: Jenna, Casey, Tyler, Jody, Dan, Sara, and Olivia. Thank you for all of your hard work! Graduate student Brandon Terrizzi successfully defended his Master's thesis. Congratulations, Brandon! 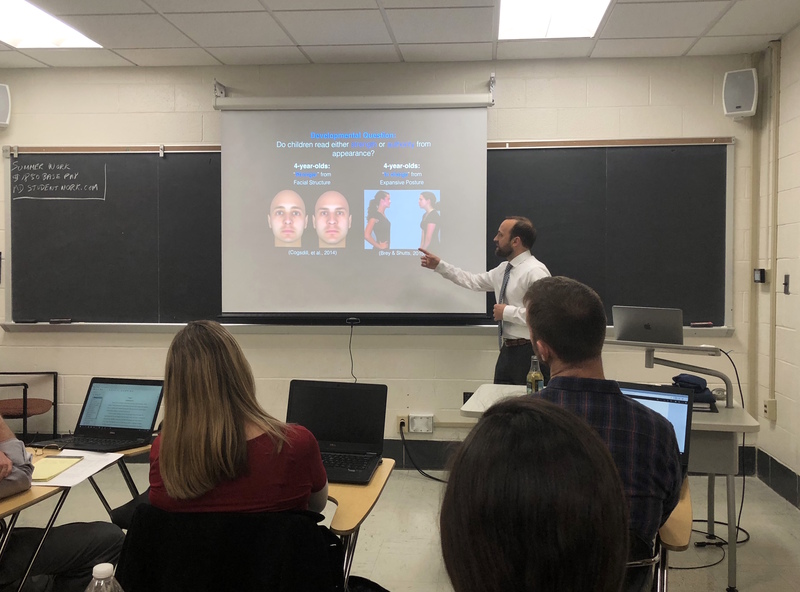 Graduate student Brandon Terrizzi gave an invited talk on his Master's thesis data at the Social Minds Conference here at UMD. We met over 150 families at Maryland Day! We are thrilled to see so many families interested in child development research. The "Routes to Selective Helping" research grant was awarded by the Canadian Social Sciences and Humanities Research Council! The team will be lead by Dr. Valerie Kuhlmeier (Investigator) and also involves Dr. Kristen Dunfield (Co-I). who took Dr. Beier's Early Social Cognition seminar. Lindsey selected Dr. Beier as her "most impactful faculty member at Maryland." 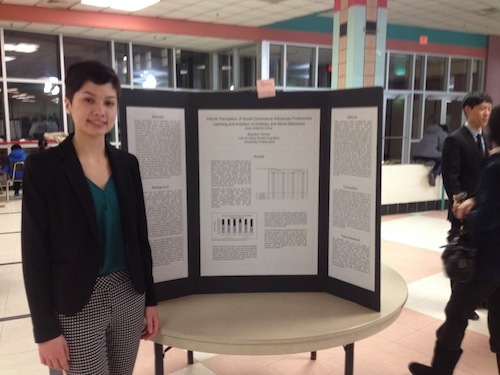 Our summer intern, Kara Watkins-Chow, presented a poster on her work at Montgomery-Blair High School's Research Ceremony. support their research and studies. Congrats and welcome! 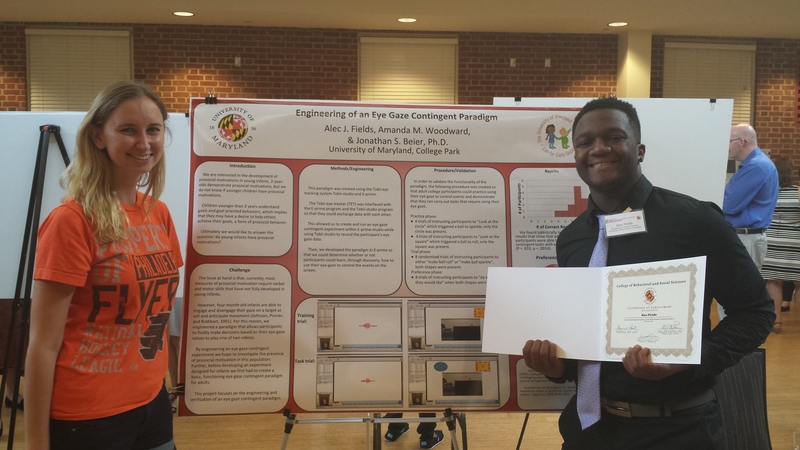 work at the UMD Summer Research Initiative closing event. View the poster here. Berlin, Germany. View the poster here. Several huge additions to the lab this summer! Emma Larson joins the lab as our new Lab Coordinator. Amanda Mae Woodward (yes we know!) joins the lab as a graduate student. Minoo Ahmadi also joins as a graduate student. She hails all the way from Iran! Kara Watkins-Chow joins our laboratory as a summer intern from Montgomery-Blair High School. She is working under the advisement of graduate student Brandon Terrizzi. Congratulations to our graduating seniors: LaRae, Kelly, Abby, and Julie. Thank you for all of your hard work! Dr. Beier wins seed funding to study the development of top-down influences on gaze cueing, via a Dean's Research Award. The Infant and Child Studies Consortium releases their 2014 newsletter. Dr. Beier gave an invited talk at the University of Virginia. Dr. Beier gave an invited talk at the University of Pennsylvania. Dr. Beier's paper on 3-year-olds' social helping was published in Developmental Psychology, with co-authors Harriet Over and Malinda Carpenter. Dr. Beier's paper on the influence of social knowledge on infants' and adults' attributions of agency was published in Developmental Psychology, with co-author Susan Carey. 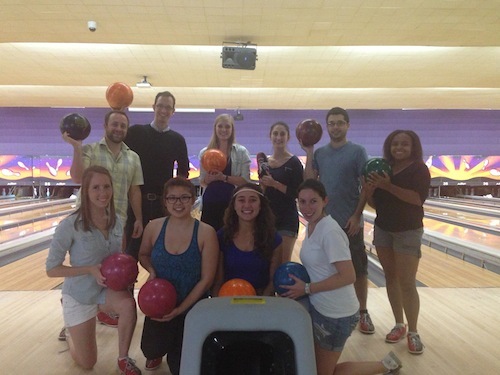 The lab celebrated the end of summer with a trip to the bowling lanes! The Infant and Child Studies Consortium releases their 2013 newsletter. 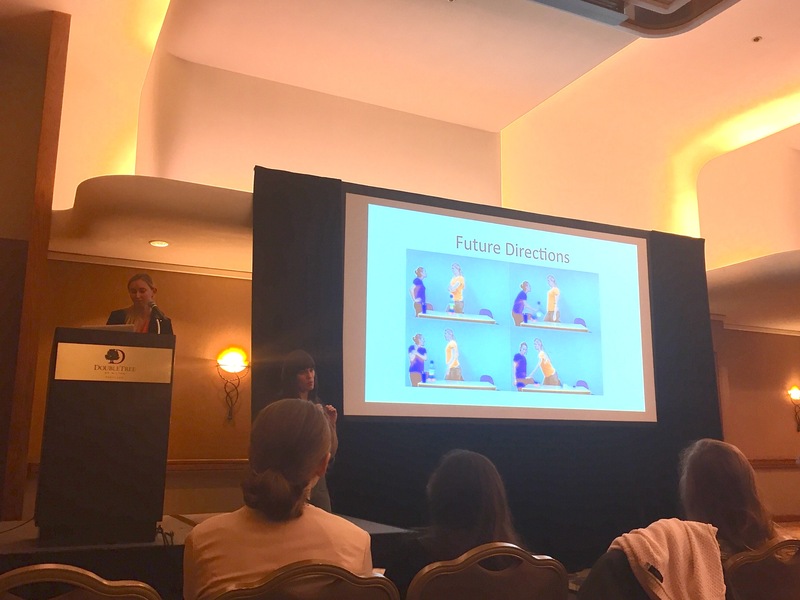 Dr. Beier gave a talk describing influences of social exclusion on children's face scanning behavior, part of a symposium on nonverbal social behavior at the meeting of the Society for Research in Child Development in Seattle, Washington. Dr. Beier gave a talk and participated in the interdisciplinary workshop on Beliefs and Desires, put on by PHLINT, a group of graduate students in Philosophy and Linguistics at UMD. Brandon Terrizzi received a Dean's Fellowship to fund the next several summers of research. 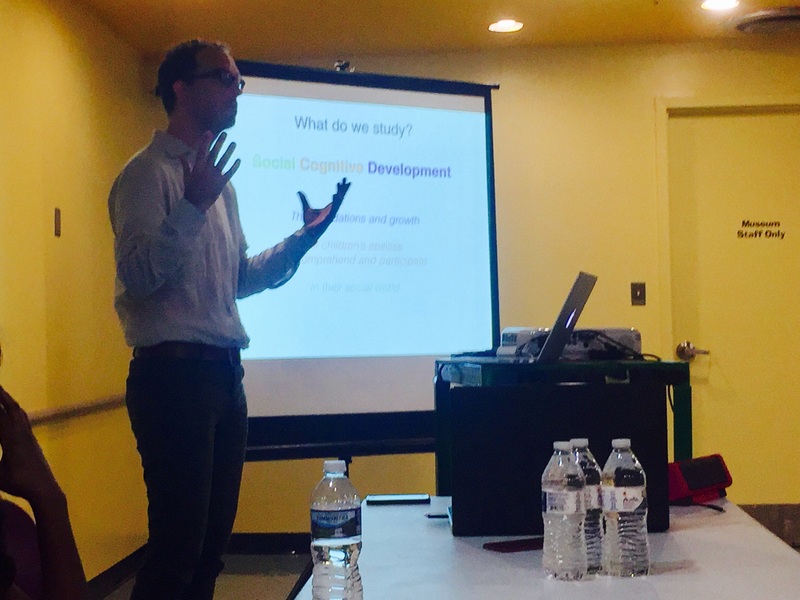 Dr. Beier gave a talk and participated in an interdisciplinary workshop on Morality, sponsored by the Developmental Science Field Committee at UMD and organized by Dr. Melanie Killen and her students. Summer brings big developments: major lab construction finishes, graduate student Brandon Terrizzi arrives, and Dana Breakstone joins as the LESC Lab Coordinator. 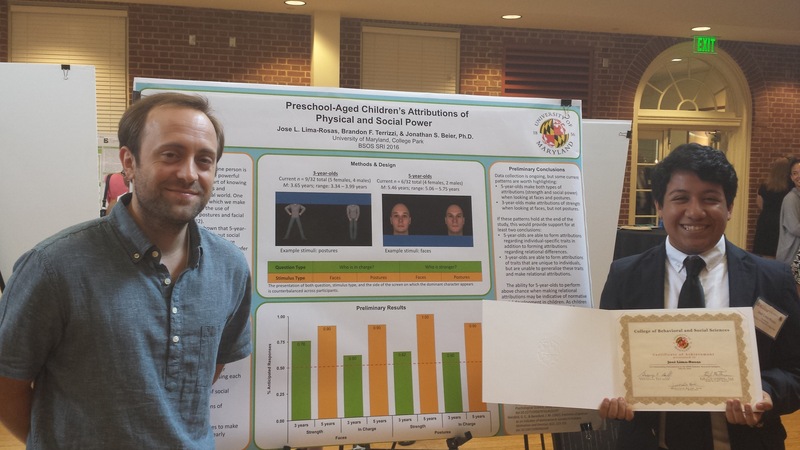 Dr. Beier gave a talk on young children's understanding of societal interactions and social relationships, at a colloquium sponsored by the Center for Children, Relationships, and Culture in the Department of Human Development at UMD. The Infant and Child Studies Consortium releases their 2012 newsletter. Dr. Jonathan Beier arrives at UMD.